The Alabama Baptist is your source for weekly coverage of the good news and good works of Baptists around the state and around the world. 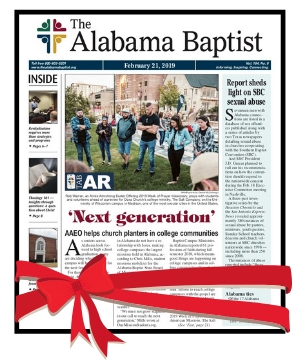 Your gift subscription recipients will receive a whole year of The Alabama Baptist (50 print issues) with resources for Christian living, concise and balanced reporting of events from the world of religion, and exploration of moral and ethical issues from a biblical standpoint. Give a gift that’s informative, uplifting, and lasts all year long: The Alabama Baptist. Each one-year gift subscription (50 issues) is $19.95; discounts are available when you order five or more — see the group subscription page. Note: Gift subscriptions are single copies mailed to different addresses. If you would like to order five or more subscriptions to be mailed to different addresses, consider a group subscription. For bulk orders (multiple copies mailed to a single address), consider a bulk subscription.